In 1994, business was booming in Japan, and especially for New Japan Pro Wrestling. The old guard (Inoki, Choshu, and Fujinami) were still active and popular with the fans, while the new guard (Hashimoto, Chono, and Mutoh) had proven themselves as ready to replace them. Every promotion's goal is to have a good balance of popular older wrestlers and talented young wrestlers and New Japan had the perfect mix in the early 90s. Sometimes though the old guard and new guard have to clash, as the old guard tries to prove that they aren't ready to give up quite yet. The new guard, on the other hand, always wants to prove that they are ready to pass the old guard and become the stars of the promotion. Fujinami and Mutoh had fought before this match, and would fight after this match as well as both were a big part of New Japan during the 90s. They were actually tag team partners for a spell early in Mutoh's career, as Fujinami helped train the young star. But the student always tries to overtake the teacher, which was the case in the 1991 G1 Climax when Mutoh defeated Fujinami in a singles match for the first time. By May of 1994 Fujinami was 40 years old but he was far from done.... in fact, he won the IWGP Heavyweight Championship that year and had only lost it one month prior to this match to Shinya Hashimoto. Mutoh had also already had an IWGP Heavyweight Championship reign by this point (as the Great Muta) and was an established main event star of his own. Mutoh had nothing to prove at this point, he had already shown he was ready to help lead New Japan, but he still hadn't passed Fujinami on the pecking order quite yet as neither had faced each other during their respective IWGP Heavyweight Championship reigns. The New Japan tour in June of 1994 was an important one, as the Best of the Super Jr. Tournament was taking place. New Japan Jr. Heavyweight wrestling was booming as well, with Jushin Thunder Liger leading the division with a supporting cast including Shinjiro Otani, El Samurai, Wild Pegasus (Benoit), Black Tiger (Guerrero), Super Delfin, Dean Malenko, and others. June 13th was the climax of the tour, with Jushin Liger and Super Delfin in the Finals of the tournament. It is incredibly rare for a Jr. Heavyweight match to main event over a major heavyweight singles match, but that shows how strong the Jr. Heavyweight division was. A sold out crowd of 6,850 packed the Osaka Prefectural Gymnasium to enjoy the show, with Mutoh/Fujinami in the semi-main event. The stage is set. They circle each other to start as the crowd is already pumped, waistlock by Mutoh but Fujinami reverses it. Mutoh goes for Fujinami's arm and gets him to the mat, snapmare by Mutoh and he applies a headscissors. They roll into the ropes to force a break, and both wrestlers return to their feet. Front facelock by Fujinami and he applies the Cobra Twist, but Mutoh gets out of it. Backslide by Fujinami but it gets a two count and Mutoh bails out of the ring to re-group. He returns after a moment, side headlock by Mutoh and he hits a side headlock takedown. Fujinami Irish whips out of it, Mutoh shoulderblocks him down and goes off the ropes, but Fujinami avoids Mutoh's attack and Mutoh goes outside the ring again. Mutoh gets back into the ring and goes for Fujinami's leg, applying a cross kneelock. Fujinami makes it to the ropes and they return to their feet, hammerlock by Mutoh and he starts working on Fujinami's arm. Mutoh picks up Fujinami, snapmare, and he delivers the Flash Elbow before going back to the arm. Fujinami gets out of it after a moment and stomps Mutoh in the back, snapmare by Fujinami and he applies a reverse chinlock. Mutoh gets a foot on the ropes to force the break, and both men return to their feet. Mutoh goes for Fujinami's leg but Fujinami catches him, arm drag by Mutoh and he re-applies the arm submission hold. Fujinami gets to the ropes, Mutoh stomps Fujinami and Fujinami rolls out of the ring. Mutoh goes to do a dive but Fujinami rolls back into the ring before he gets to the ropes. Slap by Fujinami, Mutoh comes back with a kick, Irish whip by Mutoh and Mutoh delivers a dropkick. Face crusher by Mutoh and he throws Fujinami into the corner. After the match Mutoh kneels in the corner looking stunned that he lost, as he knew he had Fujinami right where he wanted him until the old Dragon snuck out with a victory. This was Mutoh's match for the bulk of it, as he had controlled the mat against the more experienced wrestler and had survived Fujinami's best moves. But when Mutoh missed his big move Fujinami didn't waste a second capitalizing, and he stole the win away from the better wrestler that night. Veterans like Fujinami find ways to win and are always motivated by their constant fear of being passed by the generation below them. A match like this reminds me of Aesop's Fable "The Hare and the Hound:"
A Hound started a Hare from her form, and pursued her for some distance; but as she gradually gained upon him, he gave up the chase. A rustic who had seen the race met the Hound as he was returning, and taunted him with his defeat. "The little one was too much for you," said he. "Ah, well," said the Hound, "don't forget it's one thing to be running for your dinner, but quite another to be running for your life." 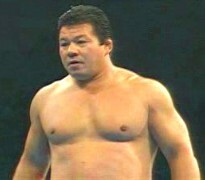 After just losing to Shinya Hashimoto, Fujinami was fighting for more then just a win in this match, he was fighting to prove that at 40 he wasn't done as the top wrestler in New Japan. Mutoh's motivation was different... yes, he wanted to beat his old mentor but at 31 he knew he was still in his prime and would get many more chances. The more a person has to lose, the harder they are to defeat, and Fujinami had a big enough bag of tricks that he wasn't about to fade into the background quite yet. It turns out, Fujinami was right, as he was far from done in New Japan. In fact, he would win the IWGP Heavyweight Championship again four years later, which he held for four months. He also won the IWGP Heavyweight Tag Team Championship two more times, proving to be one of the old guard that simply wasn't going to roll over for the next generation. Oddly, Mutoh didn't defeat Fujinami in a singles match until 2001, when Fujinami was well past his prime as a wrestler. Keiji Mutoh, as we all know, didn't let this loss stop him as he went on to hold multiple major championships over the next decade, including an IWGP Heavyweight Championship run the next year.